Bring time tracking into Xero. How to integrate TimeCamp and Xero? Xero time tracking is our new integration. It allows you to log hours spent on working for a particular client and then automatically turn the data to an invoice. The document can be easily exported to Xero, so you keep all your papers in order. All the data you want to use in order to time tracking will be synchronized with TimeCamp. By the data we mean: clients’ data (what is considered as projects in TimeCamp) and tax rates set for different types of products or/and service. Note: to enable the integration you'll need administrator's privileges. To start the integration login to your TimeCamp account go to the Settings (1). Navigate to the Addons bookmark (2). Find Xero on the list of available addons and click on "Enable" button. Click on the green "Enable the integration" button. You'll be redirected to Xero and asked to authorize TimeCamp access to your Xero account. Select organization, from which you'd like to import your Clients, and click on green "Authorise" button. 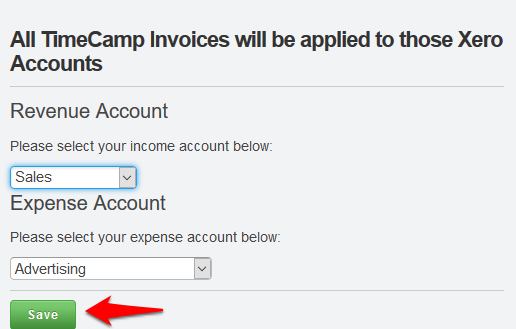 Select Revenue and Expense Accounts you wish to integrate with TimeCamp. 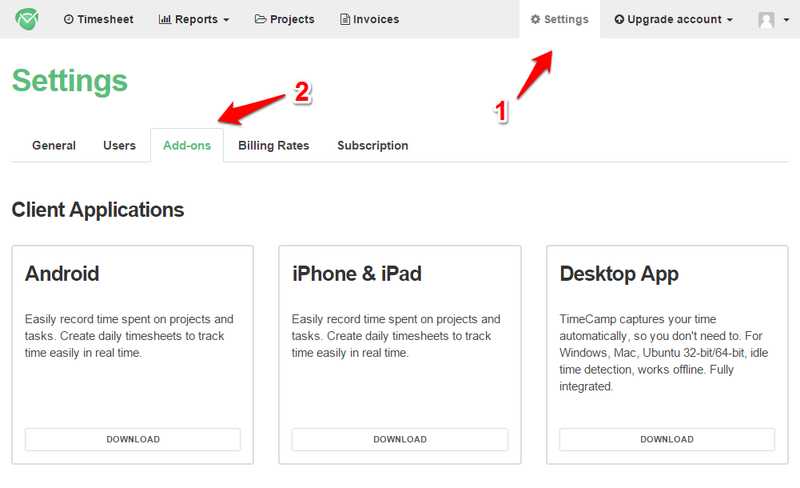 TimeCamp will automatically import all your clients, both for time tracking and invoicing purposes. From now on you will be able to track the time spent on each client. Go to Project Management page. Note that projects and tasks are already there, under the main project simply called “Xero”. You can now track time using TimeCamp's timesheets, or using our mobile or desktop applications. Tracked time can later be easily invoiced. Invoices created in TimeCamp can be exported to Xero, along with clients and taxes. 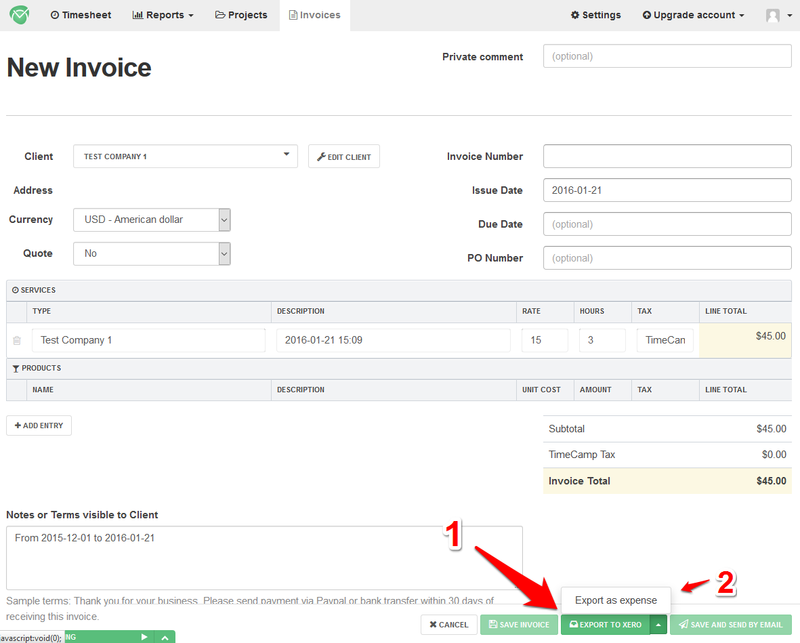 To export invoice open it in TimeCamp. You'll find export button at the bottom of the invoice (1). Optionally, you can export this invoice as an expense (2). "Timecamp has become an essential part of my work flow. I am very happy to be able to track time in this way as I have tried many, many tools and integration with Xero is the simplest and easiest to use."